A Salman Khan song in a Vivek Oberoi film? Well, if PM Narendra Modi is involved, anything can happen! Vivek Oberoi is playing the lead in the cinematic biopic made on India's current Prime Minister Narendra Modi. Titled PM Narendra Modi, the movie is directed by Omung Kumar and is scheduled to release on April 5, which is, if the election commission allows it to do so. The movie recently courted controversy when lyricists Javed Akhtar and Sameer claimed that they have not written any songs for the film, and yet they have been added in the credits. PM Narendra Modi Biopic Controversy: Director Sandip Singh Clarifies Why Javed Akhtar and Sameer's Names Are On Movie Posters. The makers clarified that they have used the song, "Ishwar Allah", from 1947 Earth, and "Sunno Gaur Se" from Dus, which were written by Akhtar and Sameer respectively, hence the credits. 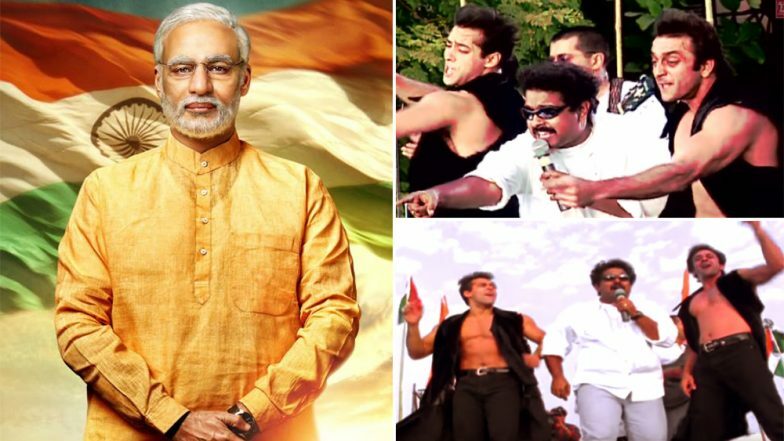 Now they have revealed the song, "Hindustani" from PM Narendra Modi biopic which is a recreated version of the Dus song. The original song was composed by Shankar-Ehsaan-Loy taken from the film, Dus (not to be confused with Anubhav Sinha's film by the same name). It had Salman Khan and Sanjay Dutt in the lead roles, along with Raveena Tandon and Shilpa Shetty. An action-packed war movie, that movie was to be directed by late Mukul Anand, who unfortunately passed away before it could be complete. However, the producers had released two songs from the film that went on to become huge hits among music lovers. Especially the title track! PM Narendra Modi Biopic Controversy: Plea Filed Against The Film in Mumbai HC, Activist Questions the 'Timing' of The Release. Knowing the animosity between Salman Khan and Vivek Oberoi that had been going on for years, wonder what Bhai feels about having his song in his not-a-friend's film. The makers have not broken any rules here though, as the rights of the original song belong to T-Series who is also involved in PM Narendra Modi biopic. So which of these two songs do you like better?